SEMrush is one of the most popular digital marketing tools in existence. 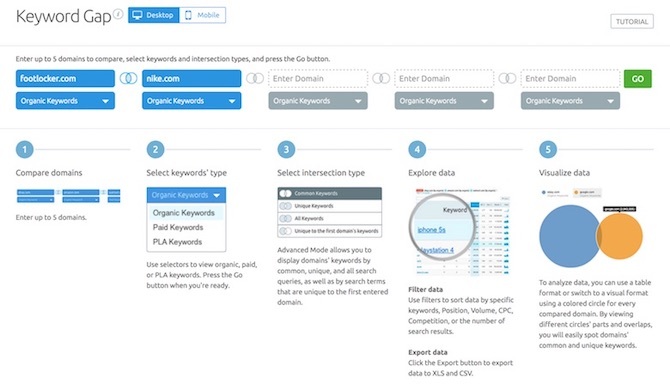 From keyword research to discovering your industry's top advertisers to researching your competition, this tool promises to have everything you need to build a proper keyword research strategy. 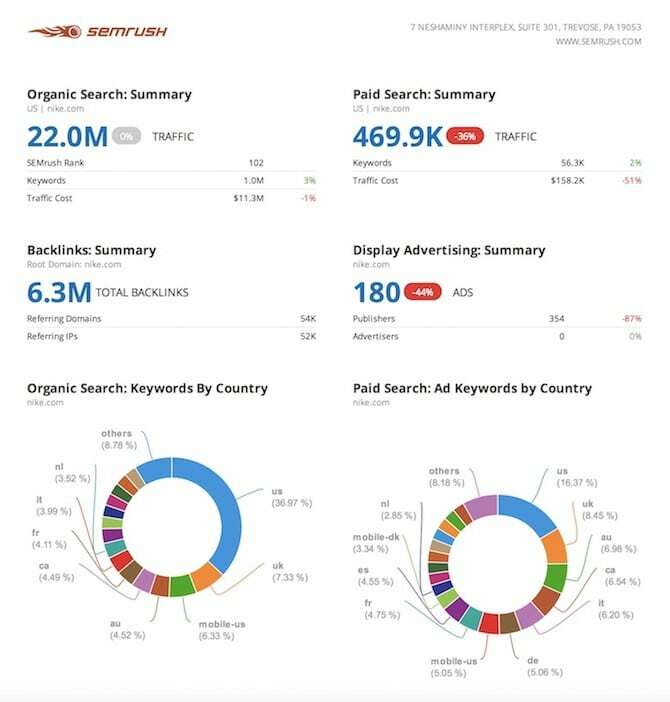 In our SEMrush review, we're going to take a look at this tool's top features to see why eBay, Disney, Amazon.com and many other top-of-the-line brands rely on it for their digital marketing strategies. This list may seem large, but SEMrush has a broad user base that ranges from small bloggers to digital marketing agencies working for big name brands, so it makes sense for its user base to be just as broad. 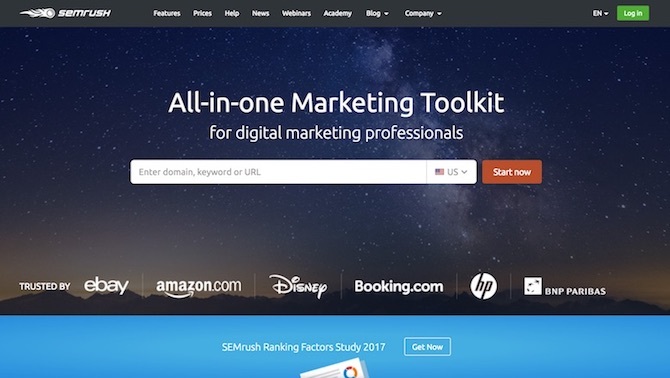 As our title states, our SEMrush review is going to focus on this tool's capability of helping you up your keyword research and content marketing strategies well enough to outrank your competition. Let's start this SEMrush review with pricing. SEMrush has three static plans, one custom plan and an entirely separate solution for enterprises. 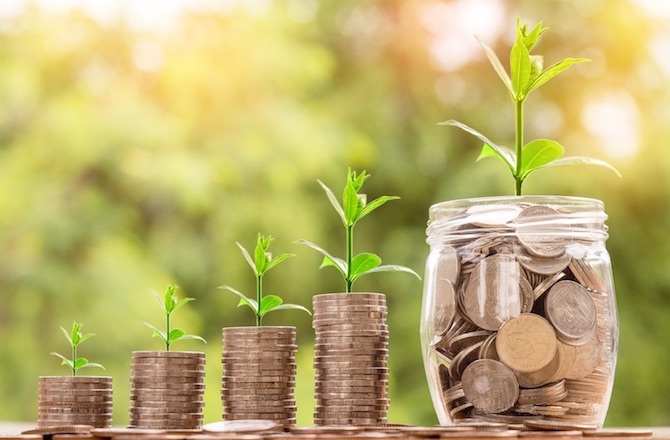 The enterprise solution features an unlimited number of projects, “extremely high” keyword and crawl limits, branded reports, and unlimited seats. Therefore, this would be the suitable plan if you own a large online marketing company. Let's talk static pricing. The first thing you'll notice are how high the monthly rates are. The cheapest you'll pay is ~$83/month, but that's only if you pay for an entire year upfront. You can use the tool free of charge, but the reports for free accounts are severely limited. With that said, this is a serious tool for serious marketers, and keyword research is just one of the many things it's capable of reporting. 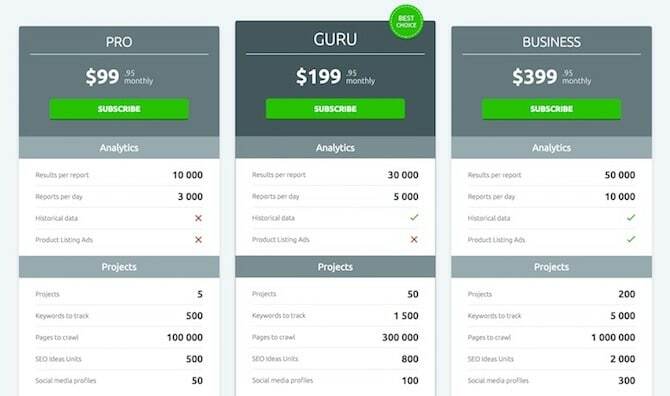 That additional user will cost you an additional $70/month for the Pro plan and $140/month for the Guru and Business plans. All plans are backed by a 7-day, money-back guarantee, and you can always give the limited version a go using a free account. Click here to start your free trial. I'm going to use Nike's official website for this review. You can see how the domain overview tool looks in the screenshot above. Most of the data you see in that screenshot is live because I'm using a Pro account. You'll need a Guru or Business account to view “historical data”. This tool makes it easy for you to analyze any domain, whether it's your own or your competitor's. Let's think of this tool in terms of analyzing your own domain. Researching competitors is up next in our SEMrush review. Let's start with the top of the Domain Overview screen. This gives you a snapshot of your domain's search data. This is important data, and you should save it so you can track your progress over time. You can click the PDF button toward the upper, right-hand corner to generate a PDF report of all of the data on this page. It's a pretty well-organized and aesthetically-pleasing report. This PDF report is also great if you offer professional SEO services to your clients. 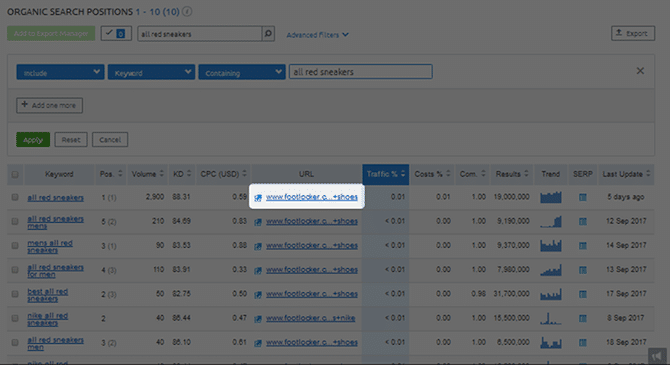 SEMrush even has a nifty little tool you can use to customize this report. 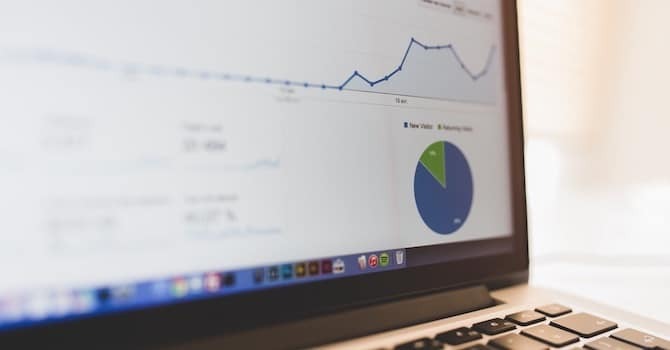 You can use this tool to dig even deeper into your own site, but we're going to take a look at it in terms of researching our competitors instead. I need to reference my original domain in order to see who my (or Nike's) top competitors are. There's a space below the fold that gives you a snapshot of your top organic and paid competitors. Since I'm hoping to improve my keyword research strategy, I'll rely on the list of organic competitors. If I click View Full Report, I can view a list of all 121,202 of Nike.com's competitors. This list is broken down into how many common keywords you have with your competitor, how many SE keywords they have, how much SE traffic they have and more. The Competition Level metric is fairly accurate, but many SEOs argue your biggest competitors are the ones who share the most amount of common keywords with you. So, instead of relying on the Competition Level column, you should focus on the one for Common Keywords. However, you need to be careful as doing this put a couple of indirect competitors at the top of Nike.com's list. This data told me Footlocker.com was Nike.com's biggest competitor, so I need to analyze that first. Fortunately, clicking on it takes me right back to the Domain Overview tool. Now, I can look at this data differently to see what's working for Nike.com's top competitor. If you want to outrank your competition, you need to see what they're doing, and do it better. Fortunately, I found this easy to do in my SEMrush review. You can use your competitor's data to do two things: see what keywords they're ranking for but you aren't and see what keywords they're outranking you for. Footlocker.com is a bit of an interesting competitor for Nike.com. It isn't a footwear brand like Nike is. It's an online store that sells Nike products alongside products from other brands. However, that doesn't mean Nike can't try to outrank them for Nike and athletic footwear-related keywords. In my SEMrush review, I came across a feature that allows you to compare as many as five domains against one another. 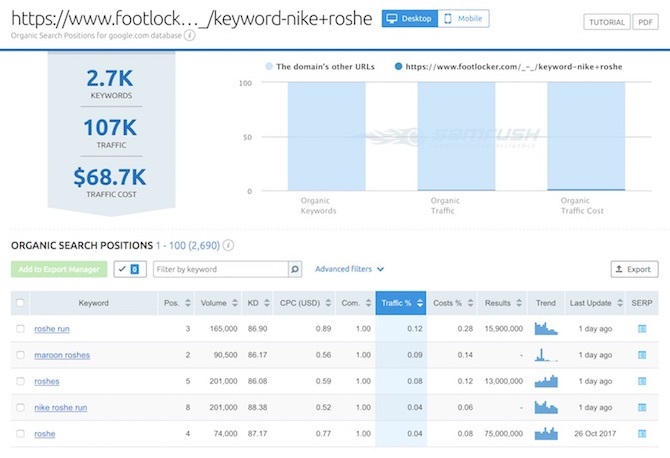 It's called Keyword Gap, and it allowed me to see which keywords Footlocker.com ranks for that Nike.com doesn't. This can be very helpful if you want to start with content marketing to strengthen your SEO efforts. I did this by putting Footlocker.com in the first box, Nike.com in the second and selecting “Unique to the First Domain's Keywords”. This led to a list of every keyword Footlocker.com ranks for that Nike.com doesn't. It even told me which position they're ranking in Google. You can also use this tool to easily pinpoint which keywords your competition outranks you for. It's not as easy as finding out which keywords they rank for but you don't, but it's still fairly straightforward. All you need to do is select “Common Keywords” instead of “Unique to the First Domain's Keywords”. All this does is displaying a list of keywords you and your competitor both rank for. I was able to make sifting through this list easier by adding a filter that excluded Nike.com's #1 search engine rankings and making it so Footlocker.com's highest rankings displayed first. I can even add a filter that excludes rankings greater than 10 for Footlocker.com. You should also focus on high-volume keywords to maximize your efforts. SEMrush allowed me to do that with another filter. Now, I can see all of the high-volume keywords Footlocker is outranking Nike for. Let's dig even deeper in the SEMrush review. 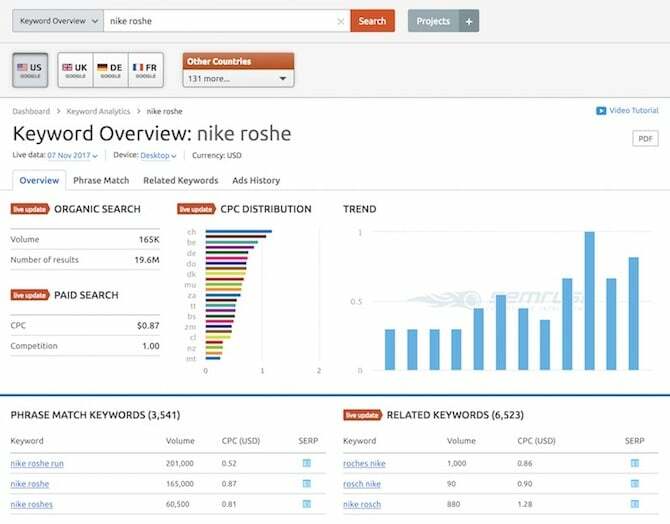 Now that I know which keywords Footlocker.com is outranking Nike.com for, I can analyze Footlocker.com's website to see why it may be outranking Nike.com. The Keyword Gap tool has an Export feature you can use to export the list of keywords you find. This is very helpful if you need to hand out this report to clients. If I go back to the Domain Overview tool using Footlocker.com's data, I can navigate to the Organic Research section. My list told me Footlocker.com outranked Nike.com for the keyword “all red sneakers”. I can enter that keyword in the Filter by Keyword box to single it out in the Organic Search Positions list. When I do this, I can see the URL Footlocker.com is ranking with using this specific keyword. I can open this URL and open the URL Nike.com ranks for with this specific keyword in a new tab and compare the two to see where Nike.com falls short. You can do the same with your own content. Aside from the homepage, I can see Nike products make up for a decent amount of Footlocker.com's top pages. 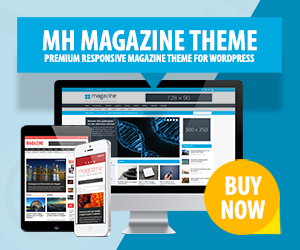 Some of these pages even rank for as many as 2,600+ keywords. 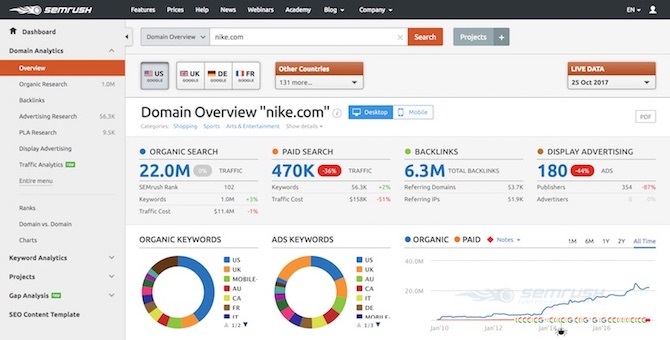 Nike can easily click on one of those keyword figures to see which keywords they should consider adding to the title tags, permalinks and product descriptions of their own product pages. This sub-tool provides loads of data for the keywords your competitor's top pages rank for. 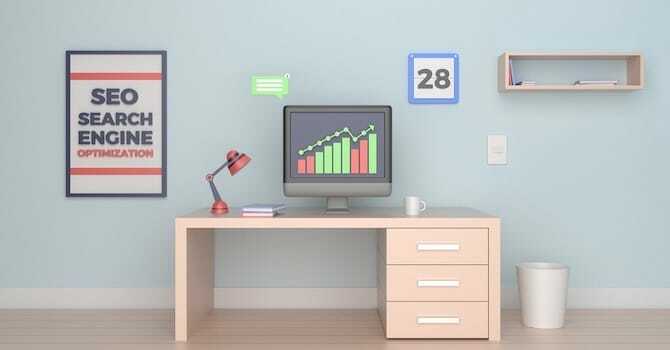 This includes the position your competitor is ranking for using a particular keyword, the amount of search volume a keyword receives, advertising and SERP data, trends, and more. I was excited to take a look at the Keyword Overview tool in my SEMrush review. It allows you to take a closer look at any keyword, and it can even help you find low-competition longtail keywords. Here's an overview of one of the keywords one of Footlocker.com's top pages ranked for. You can see the amount of data you're provided in the screenshot above. Everything is more or less divided into organic data and paid data. You're given an overview of the amount of search volume the keyword has, what advertisers are paying for it, a trend graph as well as snapshots of the keyword's phrase match keywords, related keywords, top pages and top paid ads. There are also three additional tabs you can use to view full reports for Phrase Match Keywords, Related Keywords and Ads History. My only complaint would be the amount of misspelled words that appear in the Related Keywords report. Attempting to rank for a misspelled version of a keyword is a surefire way to receive a penalty from Google, so including them in reports probably is useless. Fortunately, I can filter out keywords with low search volumes and adjust the list so the highest volumes appear first. I can then export all of this data and go through it in a spreadsheet program to build a strong list of longtail keywords that are proven to work. In my SEMrush review, I also came across the full keyword difficulty tool this application uses to score keywords based on how difficult it is to rank for them. You've seen keyword difficulty scores in screenshots throughout this review, but this tool allows you to test the keyword difficulty scores for individual keywords you input yourself. It would be best to use this tool after you've researched your competition and researched the individual keywords they rank for. However, you can also use it after you've come up with a list of longtail keywords you want to use for a post or page. Maybe Nike wants to rank for “best running shoes”. Let's input it into the Keyword Difficulty tool. This is how simple it is to use this tool to determine keyword difficulty. You can even export the data afterwards. Unfortunately, the Pro plan is limited to only testing the KD scores of up to 100 keywords at a time. This can be a problem if you’ve built a fairly lengthy list of keywords. Fortunately, you can copy keywords from a column in a spreadsheet program (I used Google Sheets), and paste them right in. 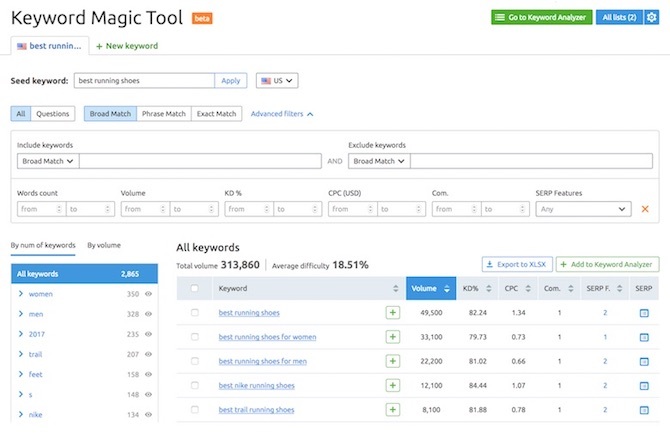 If you like the basic function Keyword Planner provides, which is providing a list of related keywords for keywords you input, you can do that inside of SEMrush with the Keyword Magic Tool. I'm using the beta version in my SEMrush review, which is free with the Pro plan until the open beta period is over. This tool provided a list of keywords related to my main keyword “best running shoes”. The tool also told me these keywords have a total search volume of 313,860 and an average keyword difficulty of 18,51%. I can even create a second list with another keyword and add any of these keywords to the Keyword Analyzer sub-tool. The CPC and Competition Level metrics were fine, but I had trouble getting the Keyword Difficulty, SERP, Click Potential and Top Competitor metrics to display. You can, however, export this list or send it to other tools inside of SEMrush. I only scratched the surface of what this tool is capable of in my SEMrush review, but the tools I did go over provide more than enough data for you to work with. Overall, I found the tool easy to use and a lot less intimidating once you get into the swing of things. If you're familiar with this tool, be sure to leave any tips and tricks you have in the comments below. For the rest of you, you can create a free account and give a limited version of the application a try right now. You'll even see offers for free trials after you log in.